Protects your car&apos;s interior from mud, fur, claws and pet odor. Our Waterproof Seat Cover protects your car&apos;s interior from mud, fur, claws and pet odor, so stop worrying about taking Fido for a ride. The Pet Seat Cover easy to install and remove. It covers the entire seat area and is made of hair and stain resistant 600D Oxford cloth that is easy to clean. Even has seat belt access. Great for cars, vans, trucks even the back of large SUV&apos;s. Use it indoors on the bed, couch anywhere. 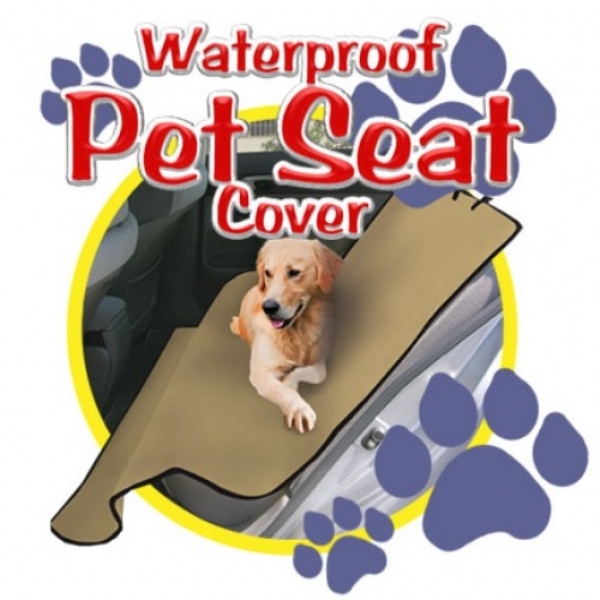 The Pet Seat Cover keeps upholstery clean, dry and looking like new! This is the 2nd one that I have purchased. My dogs can be rough and one of them likes to scratch so I had to replace it but worth the money. Our dog loves to go with us everywhere and this seat cover keeps the car seat free of dog hair and dirt. Great product. The seat cover does not fit the seat correctly. The holes for the seat belts are not spaced correctly, The bottom as no elastic or ties to keep the bottom down if it did fit. This does not look at all like the add I saw on TV. After waiting for it. Was very disappointed. I am sending it back!! Fast delivery way ahead of schedule. Saving the back seat of my truck from stains and oders.Now I have to find one for my passenger seat. For a single or bucket seat, just fold in half, line up both straps and hook them over neck rest. Works like a charm. great for the car, stays in place. bad thing is my dog had an accident and peed on it. even though it cleaned well, it left a stained. My leather seats were taking a beating by my dogs. Blankets wouldn&apos;t stay in place, but this cover is great. Stays in place and keeps my seats clean. Now to get one for a gift. it is wonderful. stains from my dog, just wipe awaY. DO YOU HAVE COVERS FOR BUCKET SEATS? MY HUSBAND LOVES TO TAKE THE DOG ALONG WITH HIM BUT THE SEAT GET A MESS. I THINK THIS IS ONE OF THE BEST AS SEEN ON TV PRODUCTS I HAVE BOUGHT YET. This is not the same as the one I bought in the past which I liked better. Can not tighten the straps enough and it sags down the back seat of my car. Also very large. You had two options when ordering and I think I may have ordered the wrong ones. Also on website it is hard to tell what they look like. I did not want a zipper in them which these have. My first cover did not have a zipper and do not like. If the other option was without a zipper I would like to send these back and exchange them. This Cover is used in my car. I couldn&apos;t get by without it. After some use tne backing has a tendency to flake off but other that it is a great product. I have 3 cars and all of them have the Pet Seat Covers installed. What a difference this has made in my cars. Easy to keep clean. A family member has a bladder control problem the Pet Seat Cover has eliminated my problems with the clean up after an accident. Can anyone tell me why this product has such a strong smell when you take it out of the package ? I currently have all the windows down, not sure how long it will last.